Recently, at the suggestion of our writer in residence, Milton Läufer, we in the Trope Tankt have been producing digital files for discussion at meetings. These productions, almost always computer programs but not constrained to be such, must be at most 256 bytes. It’s been extremely productive in terms of thinking about digital media, platforms and programming languages, and how we approach creative projects — and even other projects — generally. Postdoctoral researcher Sofian Audry prompted us to discuss this some at the last meeting. They include work by RA Chris Kerich, who has produced rather demoscene-like visual effects using Python running in a terminal, and by postdoctoral researcher Angela Chang, who has provided short example programs for use in teaching. Angela’s examples show that you don’t have to have hypercompressed, confused code when you write short, interesting programs. You can value clarity and pedagogical usefulness if you like, or you can pack in as much as possible, for instance, in order to produce a visual effect. 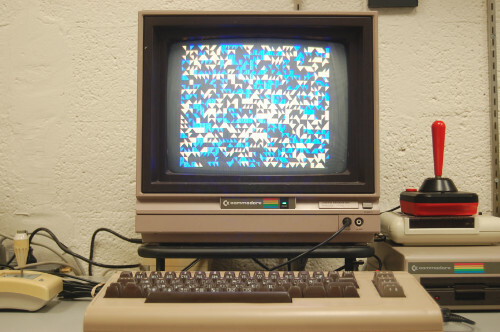 Sofian has explored creative computing history by writing a 256b Commodore 64 BASIC program that implements, or at least strongly refers to, the classic Lemonade Stand BASIC program. Milton has generated various compelling visual displays. His and Chris’s most recent programs are less clearly mathematical and regular, instead imitating the natural world. It was very apropos that Christian Bök pointed me to Dwitter, a framework for making tiny programs that can be easily shared on the Web, just recently. I’m sure we’ll all dig into that soon. My pieces include one bash script, one Python 3 program, and an executable of 256b written in assembly for the Commodore 64. The Python 3 program is actually a very tiny text adventure, Wastes, and is listed on the Interactive Fiction Database. In fact, I’m pleased to see that at this point, it has one four-star (our of five) review! Doug Orleans pointed me to “Lost Lessons from 8-Bit BASIC,” a blog post that makes the case that there were real, practical advantages to the much-maligned BASIC programming langauge, at least in the context of the home computer era. Dartmouth is celebrating the 50th anniversary of BASIC tomorrow with several events, including the premiere of a documentary on BASIC that I hope to see soon. I teach two classes tomorrow; those and my other meetings will make it impossible for me to stop by, even though Dartmouth is not very far away. There’s also a celebratory Time article about BASIC, one that is packed with nice photos, scans, and GIFs showing how programs were listed and how they ran. The GIFs include a sped-up one of 10 PRINT running in an emulator, and there’s a link to 10 PRINT CHR$ (205.5 + RND (1)); : GOTO 10, our book (by Nick Montfort, Patsy Baudoin, John Bell, Ian Bogost, Jeremy Douglass, Mark C. Marino, Michael Mateas, Casey Reas, Mark Sample, and Noah Vawter). I do genuinely appreciate the link and the article overall – there’s excellent discussion of popular programming, recollections of personally writing BASIC, BASIC in books and magazines, and even David Brin’s 2006 Salon article – but it’s too bad our book is (twice) referred to as “a book of essays” when it is actually a single book-length academic study of the title program; quite in distinction to a book of essays, it was written by the ten of us in a single voice. The book, which among other things provides the major academic study of BASIC this century, is also available for free online and anyone can download/open it in seconds to check it out. And if such a glance entices a reader, he or she may, like the popular BASIC programmer of the late 1970s and 1980s, dive further in and learn about formal, material, cultural, historical, and other aspects of the title program, the Commodore 64, BASIC, and more. Matthew Battles has a nice post about the “Programs at an Exhibition” show, up now on the metaLAB blog. I am moved by the holiday spirit of MIT’s Independent Activities Period (IAP) to announce a Commodore 64 BASIC programming workshop using original hardware. Beginning at 2pm on Wednesday January 29, we will spend about two and half hours working on short BASIC programs. Collaboration will be strongly encouraged; there will be one Commodore 64 provided for each pair of programmers. (If you negotiate with your partner, you may write something individually, however.) It is fine to proceed by modifying programs, and some will be provided for this exact purpose. Programs need not be interactive, but can be. Visual and textual effects will be our focus, but programmers are welcome to work with sound, to develop simple games, or even (gasp!) to write a program that does something useful. No programming experience (in BASIC, on the Commodore 64, or otherwise) is required. Those who are new to programming can be paired with experienced programmers, if this is suitable to both people. Also, the essentials of BASIC on the Commodore 64 will be described during the workshop. Finally, new programmers can do very interesting work by modifying programs, changing data and parameters and then getting into changing and adding code. After this workshop, the code developed will be presented and shared on the Web, where it can be run in emulation or by people who have Commodore 64s. The workshop will take place in my lab at MIT, The Trope Tank, room 14N-233. The site for the lab includes directions for getting there. I can accommodate 8-10 people, programming in pairs. Reserve a place by sending me an email. Because space is limited, please promise to come to the workshop if you write to reserve a space. It’s a Good Word. Maine. Just back from several travels, I’ve found that there’s a video record online of me, Patsy Baudoin, and John Bell presenting 10 PRINT at the University of Maine way back in April of this year. In our presentation, we answer questions and discuss the origin of the 10 PRINT project and the nature of our collaboration. And I do some livecoding. Pretty often, actually. 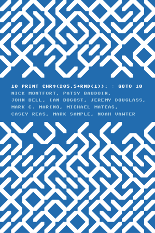 Please note that 10 PRINT CHR$(205.5+RND(1)); : GOTO 10 is available as a beautiful MIT Press book, designed by our co-author Casey Reas, ans also as a free PDF. Here’s the video of our University of Maine presentation on the “10 PRINT” program and book. Over on her site Authoring Software, longtime e-lit author and BASIC programmer Judy Malloy has written a news story about the release of 10 PRINT CHR$(205.5+RND(1)); : GOTO 10. I’m quoted, along with co-authors Mark Marino and Jeremy Douglass. Also, the book has made its way further out into the world – both the Harvard Book Store and the The MIT Press Book store now have it in stock. This means, of course, that the book will be printed and available for sale by then, which is less than a month from now. The Harvard Book Store is an independent book store in Harvard Square, founded in 1932. Of the ten authors of 10 PRINT, we’re planning to have at least me (Nick Montfort), Patsy Baudoin, and Noah Vawter there for some reading from the book, comments on the titular program and the writing of the book, and discussion. The reading is free and takes place at the bookstore itself, as the page on the event explains. Local sound artist/electronic musician Keith Fullerton Whitman released an extraordinary piece on the b-side of his November 2009 cassette hallicrafters, inc. The piece is called 10 poke 54272+int(rnd(1) *25),int(rnd(1) *256) : goto 10 and is 18 minutes of sound produced by a Commodore 64 emulator running the BASIC program that is the title of the piece. The memory locations beginning at 54272 are mapped on the Commodore 64 to the registers of the SID (Sound Interface Device). By POKEing random values into them, the SID, although it is a musical chip, is stimulated to produce sounds in what probably seems like a non-musical way: based on the effect of register settings and the sequence produced by the system’s random number generator, a polynomial counter. will put the same values into the same memory locations (and therefore SID registers) in the same order. The INT function is unnecessary because all arithmetic in C64 BASIC is done in floating point and then cast to integer whenever necessary. It’s possible that removing these functions will cause the piece to speed up, however, and I suspect it will, even though a BASIC interpreter could skip the unnecessary INT calls to begin with. There would be various ways of determining this, but the one I’d like to try involves getting two C64s, each with one version of the program, and seeing if they go out of phase. By the way, I say that these two programs will put the same values in the same order because RND(1) returns a deterministic sequence. Any time either of these programs is invoked before other calls to RND are made, they will produce the same sequence. 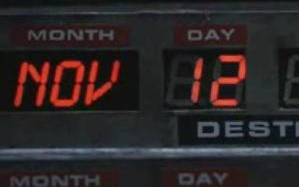 Using RND(0) would seed the random number generator on the jiffy clock, so would do different things depending upon how long the computer had been on before startup. Thanks to sound artist and digital media scholar Kevin Driscoll, a.k.a. Lone Wolf, for letting me know about this. Update: Hilariously, I overlooked that Whitman is not the author of this program – he credits Noah Vawter, a.k.a. Shifty, who is currently collaborating with me on a project about a one-line Commodore 64 BASIC program. I guess I was too distracted by that picture of an iPhone running a C64 emulator.